What is partnership for Mission? Partnership for mission is not like a conventional business transaction. Partnership for mission is not the same as a deal struck when two parties recognize how their individual self-interests can be achieved through agreements made principally for that purpose. Rather, partnership for mission is a way of being in relationship with others which enables the mutual exchange of learning, resources, wisdom, and values, so that the interests, needs, and capacities of others can be realized more fully. The relationship between and among partners in mission bears the distinguishing characteristics of transparency, mutuality, commitment to learning, and to achieving, through collaboration, what cannot be achieved by going-it- alone. Furthermore, through the practice of partnership, we are helped “to exercise care not to impose upon persons of other cultures our own cultural values and traditions.” (General Directory, 33c). At the dawn of this 21st century, women religious are exploring the terrain of this new frontier called partnership for mission. We know that we are being challenged, and yes, even called through our demographics, to reconsider the traditional mission responses we have made to social and ecclesial needs such as building and staffing universities, schools, hospitals, and orphanages. We are all intuiting that we must search for new ways and new relationships through which we will continue, in our SSND foundresses words ,to “Go out into the whole world, into the poorest dwellings wherever the Lord calls us, to announce to children who are poor, the good news of God’s reign.” (Blessed Theresa). Partnership is also a spiritual practice. It is indeed a journey in faith. It involves a willingness to explore a call, to befriend the unknown, and trust that God-is-with-us. 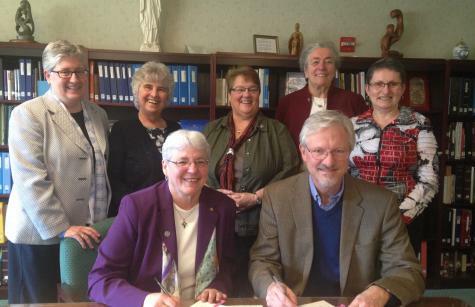 In 2012 the School Sisters of Notre Dame made a commitment to "direct our resources and ministries toward education that transforms and calls all to eliminate the roots causes of injustice." The Atlantic-Midwest Province responded with four concrete actions. One of them is to partner with organizations which are addressing needs in Haiti. We have partnered with the organization Beyond Borders to help the people of Haiti. Partnership serves a very practical need. Partnership provides for SSND the mentorship and collaboration of an intermediary organization serving in Haiti—an organization with experience and credibility in Haiti, in order that we might learn about Haiti, learn about ourselves as partners in Haiti, as well as explore how best to “read the signs of the times, risking innovative responses to the needs….” (Constitution Prologue p. 19). 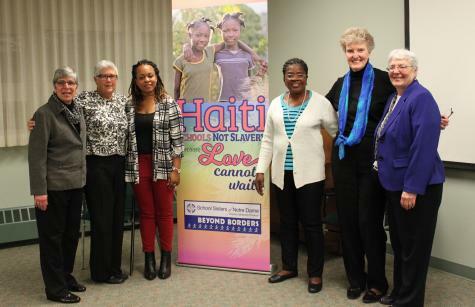 The Atlantic-Midwest Province of the School Sisters of Notre Dame, Inc. is exploring the new frontier of mission for women religious by moving forward in a partnership with Beyond Borders, Inc. to work together to address needs in Haiti. Among the 23 families that the Atlantic-Midwest Province of the School Sisters of Notre Dame are sponsoring in Beyond Borders’ Hurricane Matthew Family Sponsorship Program are the Merolus and Setout families in the community of Matènwa. We stopped by to visit with both families one afternoon this February to see how they were doing as the Hurricane Matthew Family Sponsorship Program nears its end. Read more here. Thank you again to the people of the Atlantic-Midwest Province of the School Sisters of Notre Dame who gave so generously to support the recovery of 23 families in the villages of Masikren and Matènwa on Lagonav Island. Click here to read more. 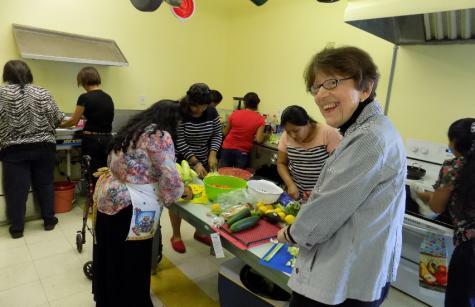 Twice a year the School Sisters of Notre Dame award grants to organizations working for justice. These groups benefit people, mostly women and children, caught in poverty, human rights abuses, or environmental devastation. 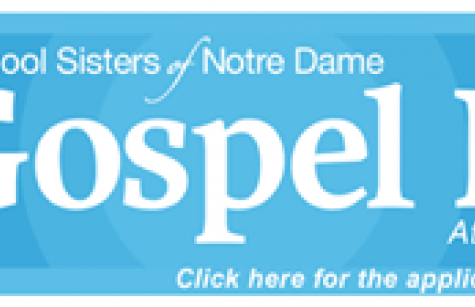 Learn about the Gospel Fund program. 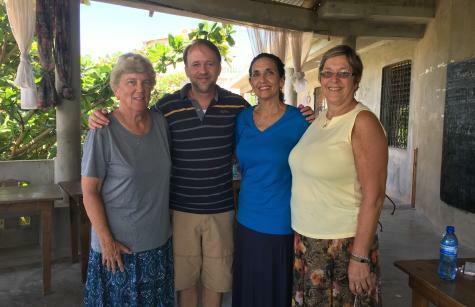 Sister Sharon Slear, SSND of Notre Dame of Maryland University and two colleagues, Kathleen Sipes and Cynthia Cassone, traveled to the island of Lagonav in July, 2017 to begin a teacher training initiative at the Matenwa Native Language School on the island. The purpose of this training is to further educational development on Lagonav by supporting teachers in their work to devise intervention strategies to increase success in school for students with identified needs. The generous support of SSNDs and their many students, staff and friends who contributed $40,000 to the province’s Hurricane Matthew Fund has been supporting 23 Haitian families (167 women, men, and children) in rural Haiti as they continue to recover from Hurricane Matthew. Even before the storm, these families were among the poorest of the poor, struggling to meet their basic daily needs. Through your generosity, your care, and your concern, the SSND family is giving these families a path to a future, filled with dignity, hope, and opportunity. There is a song in the play Les Miserables when the lyrics “to love another person is to touch the face of God,” sear our souls with their profound and poignant truth.